Following on the conclusion of U12 girls competitions for 2015 we recently had a gathering at the Clubhouse for this year panel of players to thank them for their commitment and effort during the year. 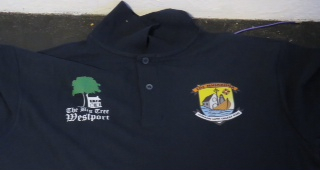 There were a number of acknowledgements to be made, Firstly there was a presentation of Polo shirts to the panel which was kindly donated by Walter Halloran of the’’ Big Tree Pub’’. Due to circumstances beyond his control Walter was unable to attend on the evening, but on behalf of the management of the Team and Kilmeena GAA Club we would like to take this opportunity in sincerely thanking Walter for his kind offer of sponsorship of the Polo shirts which is very much appreciated by everybody involved, earlier this year we also wish to thank Molloy Shellfish for sponsorship of the girls football kit. We would encourage all Club members to support our sponsors. This Year we incorporated a skills test into our training schedule the first of which took place at the beginning of the season and at the end, the test is a good measurement of players skills as they develop throughout the year. 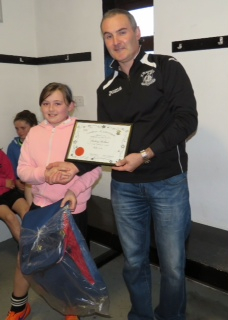 The Winner of this competition was Ashling Hoban who was presented with a kit bag and certificate by the U12 Manager Ollie Mulch one, well done Ashling. And finally a big thank you to all the parents who car pooled and supported the players throughout the year, and also the management for the work they have done during the season.